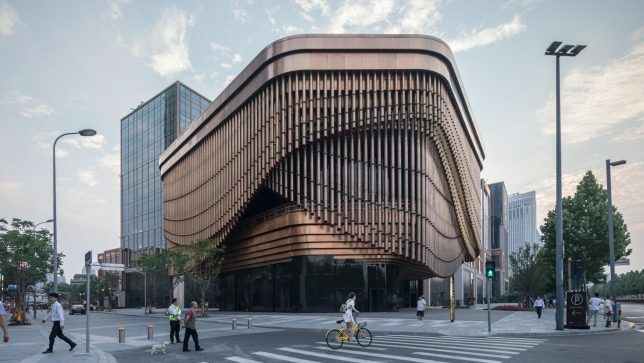 This mesmerizing mobile facade is an aesthetic and engineering marvel, but one has to wonder: could the mechanisms behind it be appropriated for other architectural purposes, like: providing light and shade on demand or on a schedule? 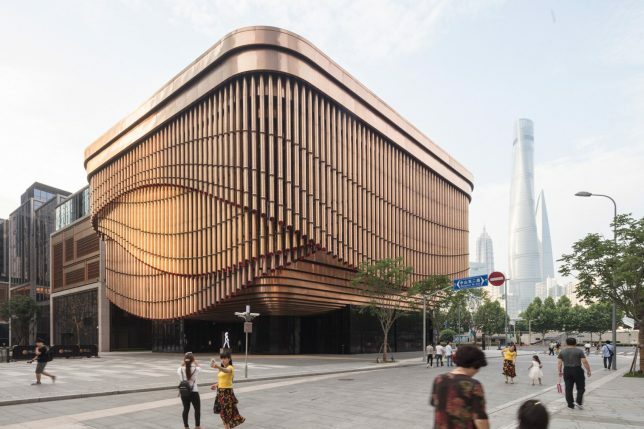 The dynamic design wraps a new cultural center in Shanghai, part of a 190,000-square-meter development by Foster + Partners in collaboration with Heatherwick Studio (images by Laurian Ghinitoiu). 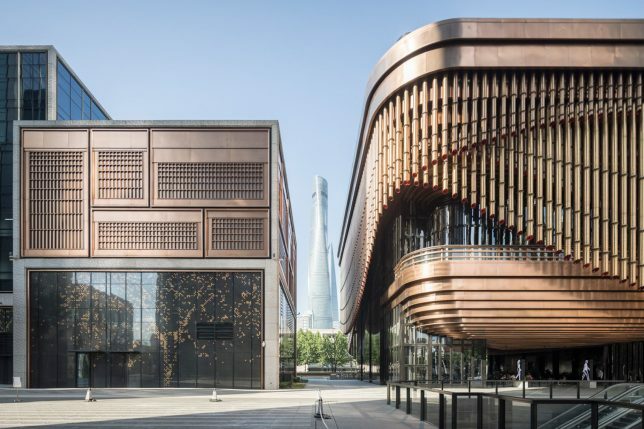 It was inspired by Chinese theaters with bamboo-like bronze tubes set in three layers around the perimeter, constituting what the designers describe as “a moving veil, which adapts to the changing use of the building, and reveals the stage on the balcony and views towards Pudong.” The effect is certainly stunning, but despite the description, it seems to be mostly for show — an novelty experience for visitors and viewers. The same kinds of systems, however, could be deployed more strategically, using other kinds of semi-opaque screens, for instance, that could automatically position themselves throughout the day to provide layers of shade. 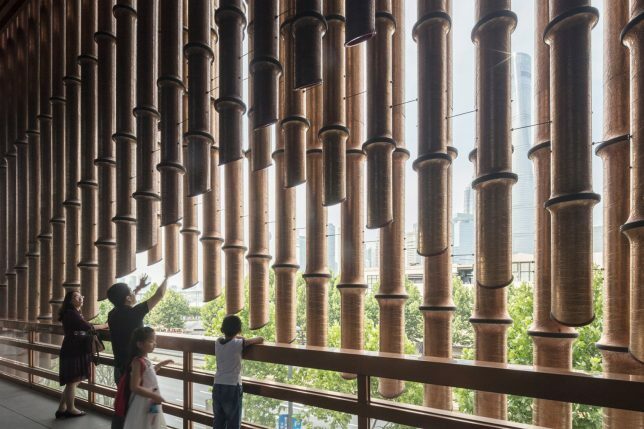 Such an application would have practical benefits, reducing cooling costs inside structures and increasing human comfort. 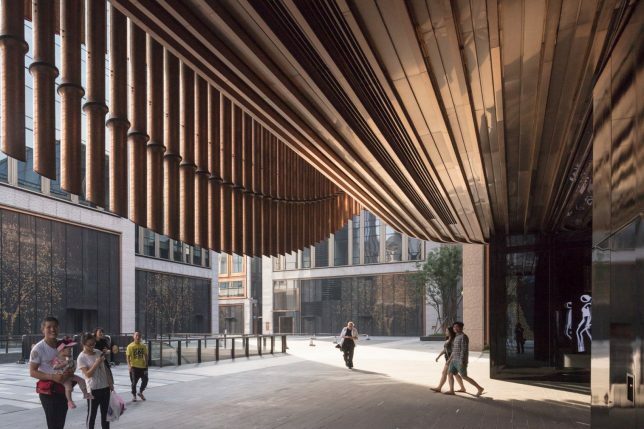 Alternatively, a similar screen system could be controllable by occupants, allowing building users to block off sections for things like meetings or film screenings requiring different amounts of natural light. For now, it remains a fascinating one-off work, but hopefully architects will consider adding this as a tool in their kit, applying similar technical sophistication to solve other site-specific design problems.